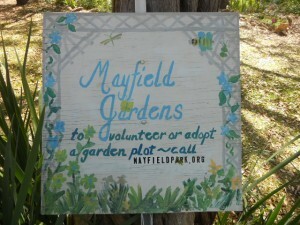 Interested in adopting a Mayfield Volunteer Garden? It is easy. A garden committee member will identify which gardens are available and discuss in general what is expected of the adopters. This will provide background to help make sure the individual plot stays in the overall theme of the historic garden design. The Garden Committee welcomes individuals, families, groups, etc as adopters. Adoption Process: Please contact Janice Brown to discuss adopting a garden. Contact information is on the Contact and Partners page. 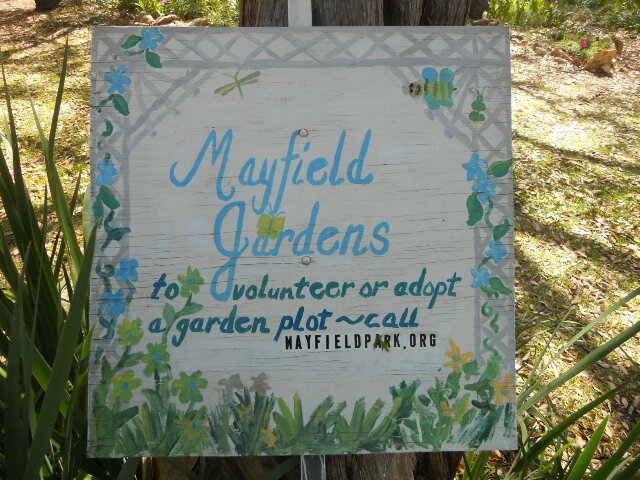 There is a one-time fee of $20 to purchase the name plate for the garden. Strive to plant “heirloom” varieties of perennials and bulbs. Tools and Supplies: There is a gardening shed with implements, fertilizer, occasional free plants and bulbs and a first aid kit. An irrigation system is used for watering and hoses are available. There is also an ongoing need for general volunteers. Weeds abound around the exterior of many of the plots. And just the presence of a volunteer is of tremendous benefit. Volunteers are encouraged to remind visitors to stay on the paths, off the walls, out of the ponds and to leave the dog at home.